Wasps can inflict a painful sting and multiple stings or stings to sensitive areas such as the head or mouth can be serious. In rare cases even a single sting can cause anaphylactic shock (an extreme reaction to the wasps vemon). Without rapid treatment, this can lead to death. The application of insecticidal dust to the nest or nest entrances should ensure successful eradication. The cost for treatment of a nest is £48.00 (including VAT). I have more than one wasp nest. Does this cost the same? We inject a residual insecticide dust called FICAM D into the nest. We do this using a tool called a PA2 Applicator. This uses compressed CO2 to deliver a high pressure dose of the insecticide into the nest. The FICAM D will start working immediately, killing most of the wasps within a couple of hours and all of them within 24 hours. I cant see a nest, the wasps just appear to be going into a hole? The majority of the nests that we treat are like this. Common locations for wasp nests are under roof tiles, in soffits and even underground. We treat these by injecting the insecticide into the entrance hole. This is just as effective an injecting it directly into the nest. Do you need to get into the roof? The nest appears to be high up, how do you reach it? Our applicator tool has long extension lances which mean that most high up nests can be treated from the ground. This is much safer than using ladders. Do you actually remove the nest? No. Once all the wasps are dead the nest is completely harmless and can left alone to degrade naturally (the nests are constructed of a paper like substance). If the nest is in a conspicuous area (such as in a shed) you can put the nest into a bag and put it in the dustbin. We recommend leaving the nest for a week after treatment before removing it to insure there are no live wasps remaining. If you really don't want to handle the nest yourself we can remove it a day after treatment for an additional £40.00. What should I do after you’ve carried out a treatment? Following treatment we recommend keeping away from the nest for at least a few hours. Immediately after treatment the wasps in the nest will become hyperactive and wasps that are out foraging for food will return to the nest. This means that for and hour or two the numbers of wasps flying around the nest can significantly increase. You treated a nest for me but I’m still seeing wasps flying into it. 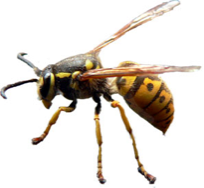 If you are still seeing wasps around the nest 24 hours after treatment, give us a call or email us and we will return and treat it again, free of charge.